“Howard, stop being a perfectionist,” his writing coach had said. Howard leafs through his notebook with blog post ideas. For once, he wants to start his next article early. But what he really wants, is to write faster. He wants to write without so much head-scratching and stress. He wants to stop last-minute editing. He wants to write with more joy. Howard gets up to brew a cup of coffee. He can’t find the right idea for his next post, and without the right idea, he’s wasting his time. Isn’t he? In the kitchen, he brews his coffee, and empties the dishwasher. Then he trudges back to his little office upstairs. Should he pick a half-decent idea and see whether he can turn it into a good blog post? We all know perfectionism slows us down. But when is perfectionism simply striving to write better? 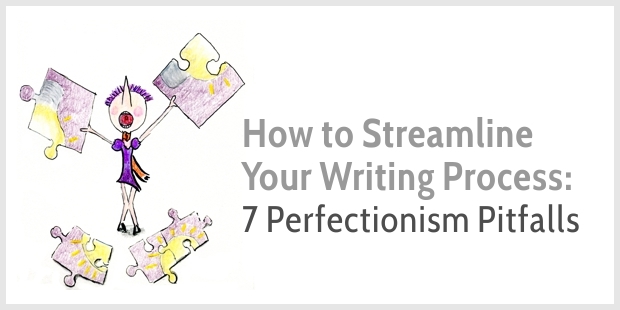 And when does perfectionism become an unhealthy habit, sabotaging our writing process and spoiling our fun? I used to think perfectionism meant being afraid to hit “publish”—as if perfectionism only blocks us at the very last stage of writing. But, I’ve since learned perfectionism can spoil my entire writing process. Because perfectionism manifests itself in different guises. For instance, perfectionism can stop me from starting my next blog post. It can mess up my outline. And yes, it can mean I edit endlessly. 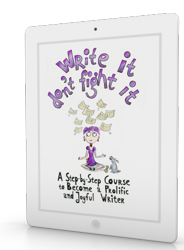 Want to know how to stop perfectionism slowing you down? And want to make your writing process smoother, and faster? Yes, I agree—procrastination and perfectionism are closely related, and the same is true for self-doubt. When we doubt ourselves, we procrastinate more (and we blame it on perfectionism). I think the creative process feeds our insecurities. As we explore new ideas or techniques, we’ll feel uncertain because we’re never quite sure how our ideas will turn out. It’s hard to get rid of our self-doubts; we’ll just have to learn to dance with our fears! LOVE this – learn to dance with your fears! Fantastic! I particularly love the “you” inserted in the one image to make the point about perfectionism! Stroke of genius! I love all the tips and the clear process. I’ll have to put this beside my computer! LOL! Proves the point even better… ? A musician friend of mine once told me that if I made a mistake while playing, make the same mistake again the next time like I meant it and everyone would think I was playing jazz…? A famous filmmaker Casey Neistat said, “Perfection erases humanity.” Your blog post reminded me of his quote. I agree with all the points you mentioned. I also need to embrace the fact that being pragmatic and exposed to the world might seem difficult in the beginning, but at the end of the day, it will help us improve and move on to the next level. I think it’s a mindset game. Once you develop a mindset that you have to keep moving forward no matter how many people like your stuff, you set off on the right track. It’s tough to hardwire your brain that way, but once you make it happen, it does wonders for you. I love that quote! I hadn’t heard it before, but it’s so true. And yes, I agree, it’s about mindset, and also about habits—the more we publish, the more we get used to our fears. Great illustrated guide, Henneke. Just what I needed. A BIG kick in the right direction in less than 4 minutes 😉 Thanks. Hey Tine, I’m happy to see you’re still around! And I’m glad this post came at just the right time for you. Happy writing! And wishing you a happy and creative New Year, too! I read “Big Magic” last year (or the year before? ), but somehow it didn’t quite resonate with me at the time. Perhaps I need to try re-reading it. I love that quote about “fear in fancy shoes!” Thank you for sharing. Super fun graphics, Henneke. Seems to me the pragmatic approach nails it! What a sweet and to the point post. This makes it easy to see where I get bogged down in my writing. Thanks. I’ll use the info to shift my attention and writing. Don’t despair, Julie! Once you know what’s going on in your mind, you can actually do something about it. What also helps me is making the steps as small as possible. So, instead of tasking myself with writing a whole post tomorrow, I simply aim to pick an idea and jot down a rough outline. LOVE LOVE LOVE this!! This was perfect this morning for me. Thank you, Cornelia. I’m glad it came at the right time for you. Happy writing! I am loving your tips! I also read your book and that was great as well. My company is doing a website relaunch this week and you have truly helped me with my writing process. I look forward to your future emails. Thank you! Good luck with your website relaunch! Whatever I write, or try and write, that inner voice tells me that this time I’ll be found out to be a fraud. I’ll print out your infographic and hang it above my workspace so I can help silence it for good. I’ve never been able to silence that inner voice completely. She can be quiet for a while, but never for long. She’s part of me and I am learning to live with her and to keep writing despite her/my fears. I think it’s normal that every time we start something new, we feel a little fearful. But without that fear, there’s no opportunity for personal growth. Happy writing, Mariken. And thank you for stopping by. Hi Henneke, thank you for more wonderful insights. Your Perfection tips round out your recent 5 Step Revision Process. Striving for perfection results from stopping to edit while creating new content. I am guilty as charged and find it kills the flow of getting ideas onto paper. Yet we do not stop to edit our thoughts in a conversation. Conversation is the real-time flow of ideas. If the listener doesn’t understand then we have another go to clarify our meaning. To keep words flowing I try to keep my mind in conversation mode and leave editing until the 5 step process. Then I can listen and judge what I have written by reading it out loud. I love your idea of keeping your mind in “conversation mode” to write down your ideas. I certainly find it a challenge, too, to keep the words flowing and not get distracted by editing. The weird thing is that when I manage to silence my inner critic for a while and write a first draft without distractions, the content is usually better and requires less editing! Thank you for adding your valuable thoughts, Paul. The sun was shining here briefly, too! Wonderful!! Visuals are compelling – beautifully crafted infographic. Thank you!!! Thank you, Barbara. I’m glad you like the visuals. It was my biggest drawing project ever! Henneke, what a fun post, and Henrietta is looking amazing. I will print this and post it on my notice board, and – as usual with your posts – share it on my writing group’s facebook page. And of course, will do my best to follow your tips. I’m not a perfectionist, but procrastinator? – yes. Maybe that is a form of perfectionism – always waiting for the ‘perfect’ time to do something. Thank you. Yes, yes, I know …. waiting for the perfect time! I’ve been there, too. I’ve found the trick is to learn how to get started by making the first step as small as possible. Have you read the book “The Now Habit” by Neil Fiore? He argues that procrastination and perfectionism are both caused by self-doubt. I think he’s right. I couldn’t take my eyes off the info-graphic and marvel at the amount of work it must been to make it. I must declare it is utterly timely in my life. Sometimes I worry if my work is good enough and other times, I know it is not and don’t know what is wrong with it. I’m positive sometimes it is not good, because even the readers are not excited about it. This post will help me though, I’m also sure of that. Yes, you’re right. It took a crazy amount of time. I wanted to time it as I was interested to see how long it would take me, but after a few hours, I gave up. It’s too scary! My best estimate is around 20 hours—it was a labor of love, and my biggest drawing project ever! I’m not complaining, though, because it was fun to do and a good challenge. A labor of love…I feel the love. 🙂 Thanks for the link! I will get back on it after I’ve read. “I feel the love” — that makes me happy. Thank you. Love it. You’re bang on. I have found myself falling into that perfectionist trap quite often. We’ve all fallen into that trap far too often! Wonderful work, I really enjoyed it! The content is a great reminder not to strive for (unachievable) perfection. Love your drawings – warm, illustrative and fun. Thank you! Thank you for your lovely compliment, Irina. It was so much fun to draw this (but also challenging!). Henneke, I love this post. (and your fab fun infographic). Especially as I just published my latest newsletter and went through almost every one of those perfectionist pieces. I sent it out thinking I had changed the working title but hadn’t. And here I am, still alive and perfectly OK. As of this moment, I intend to be much more pragmatic. Life really is too short to stuff mushrooms! I know. I’ve been there, too. I almost sent out the email for this blog post with a glaring grammar mistake (“then” instead of “than”). This time, I caught it just in time, but it doesn’t always happen. And surprisingly, we always survive. The glitches really don’t matter as much as we think. Thank you for stopping by again, Joan. I always appreciate it! Thank you so much for sharing the infographic on your site, Penelope! Hey, that resonated with me so much….Now I can tell myself to just start with whatever idea I have and stop waiting for that perfect blog post idea!! Hi Shewta – I’m glad this resonated so much with you. And yes, stop waiting for that perfect idea because you may be able to turn that not-so-perfect idea into a great blog post! There are days when you get up in the morning and say,” I want to write a blog today”. But when you actually sit to write, you become too self critical and assume some topics wont work with audience. The methods you have suggested seems to be the only method to get the best out of writer. Thanks. I know the feeling of killing our ideas much too quickly, Amrut. It’s hard to trust our initial gut instinct and persist. I appreciate your lovely comment. Happy writing! Some really practical tips to put into action to get off the perfectionist treadmill. Love the simplicity of the infographic but the powerful message it conveys. Thanks again for an informative post Henneke. Thank you for your lovely comment, Poovanesh. I appreciate it. Thanks, Henneke you absolutely hooked the culprit perfectionism. It has been 5 months I set up my blog where I am able to write very few articles because of those reasons.your infographics are absolutely spot on. Thanks for the motivation and free guidance. Hi Vijay, I do hope you write and publish a few more articles soon! THE most beautiful infographic I’ve ever seen. Wow. That’s a BIG compliment. Thank you so much, Syed. Thank you for the post, Henneke! It’s the second time I read it and everything you said resonates with me much more than the last time. I’m walking away from the perfectionist side gradually, but my concern is that: is my writing improving? It’s not always easy to detect whether our own writing is improving or not. One thing that can help is go back a year or two—how has your writing evolved? That makes sense. Thank you! :)) I think my writings are easier to read than before because I try ‘less hard’ now. They are still far from being good, but I guess it takes time and practice. At that time, I was probably still figuring writing myself! Happy writing, Valerie. Thank you for stopping by. Wow…beautiful infograph and the message. The best way is to simply write something you feel valuable. And if you are a harsh critic on your work then hire someone else to do the edit. Either way, publish your work. The worst that can happen is – it will be lost and readers will send angry mails. Fine…now work and write better from the suggestion. Good luck. Now I don’t need the perfect first sentence to start. You and Henrietta really got to the meat of the matter on shrugging off perfectionism, which can be truly crippling. Thanks for making it so clear how to just START writing.